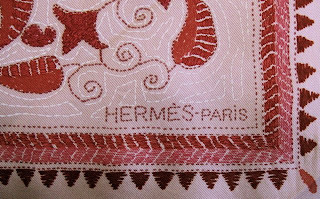 The Carré Kantha was first issued in Spring/Summer 2009 as part of the 'Year of India' collection. 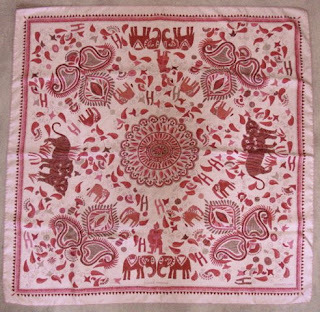 The design is inspired by traditional Indian patters, which is why no specific designer is credited. 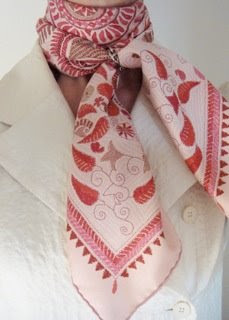 It is truly amazing how perfectly the effect of embroidery is matched in every detail of the scarf! 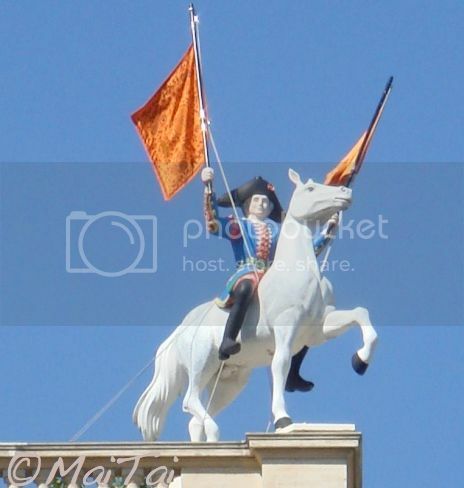 When visiting FSH last summer, I saw the horseman on the roof top heralding Carré Kanthas in a beautiful orange/saffron CW, it was such a lovely sight. I totally agree with lifeatmyfingertips the pink suits you beautifully MaiTai! Thank youfor sharing these gorgeous photos! 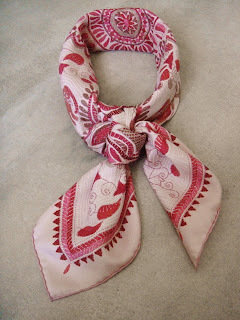 From your least favorite scarf to this!!! ...and you most certainly are pretty in pink. Pink would never be a color I would normally pick but after your post, I am rethinking my decision--it looks beautiful on you. Looking forward to learning the waterfall knot--I have tried it without much success. Btw I also thought it was tied in the friendship knot. 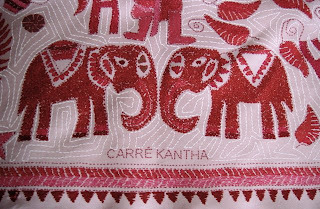 I have to say that it's your post that had me re-thinking about the Carre Kantha. I passed on it when it was out last year because I thought it was too 'ethnic'. But the design grew on me, and I can't help thinking about it. Your post sealed the deal for me. Fortunately I was able to track down one with the help of my local store - it's a lovely white colourway with contrast trim. Just beautiful, you really do look marvellous in pink!! I am venturing more into color, your gorgeous shots make it an irresistable certainty!! andiamo, msT and Angela ~ thank you ladies, happy you enjoyed the profile! Sorry to come back so late, the answer I wrote earlier must have got lost in cyberspace..
andiamo, you are right, the Kantha has taken quite a journey! These days I find myself reaching for it more and more, couldn't be happier! 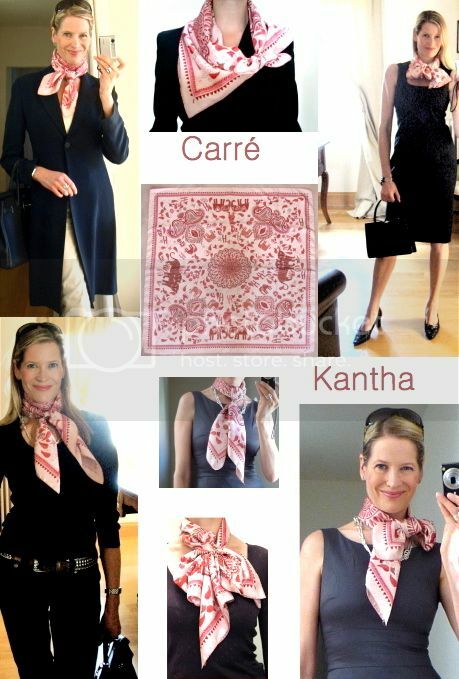 msT, it truly is an amazing scarf. The ethnic touch makes it fun and easy to wear.. and yet it is luxurious and fabulous. Angela, congrats on your winter white CK!! 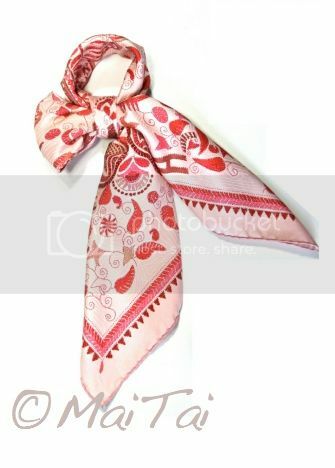 What a sweet and great SA you have.. enjoy your beautiful scarf!